As temperatures dropped, New York Cares kicked off its 24th annual coat drive earlier than expected, asking for immediate aid in the aftermath of Hurricane Sandy. As temperatures dropped suddenly over the past few weeks, volunteer organization New York Cares kicked off its 24th annual coat drive earlier than expected, asking for immediate aid in the aftermath of Hurricane Sandy. 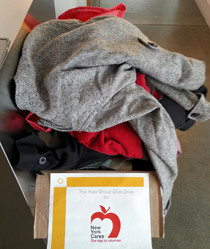 Branding and marketing communications agency The Halo Group has been a proud supporter of the annual coat drive. While we usually begin the coat drive after Thanksgiving, this year employees were able to quickly come together and give support to New York Cares, making a difference in the lives of Hurricane Sandy victims and for all New Yorkers in need. Halo staffers have been generous in donating new or gently worn winter coats to help New Yorkers in Staten Island, the Rockaways, and other hard-hit areas. The coat drive will continue through the holidays. According to New York Cares, 90% of homeless adults need a new coat each winter because they have no place to store one over the summer months. But this year, it's not just the homeless who need our help; thousands of New Yorkers have been left out in the cold as a result of the storm, creating unprecedented demand for warm coats. As in previous years, Halo Group will also hold a food drive this holiday season, donating canned and non-perishable items to the food bank at the Church of St. Francis Assisi in Midtown Manhattan.